It's your usual, quiet, out-of-the-way little town. Konami jumped on the Survival Horror bandwagon (created by the success of Resident Evil 1) with 1999's Silent Hill, the first game of Konami's Silent Hill franchise and a far more psychological take on the Survival Horror genre. Single father Harry Mason and his young daughter Cheryl are driving to the resort town of Silent Hill for a holiday vacation. Suddenly, Harry swerves to avoid a girl standing in the road and crashes his car. When he regains consciousness, Harry realizes he has crashed on the outskirts of Silent Hill, and that Cheryl has left the car. Stumbling into Silent Hill, Harry discovers a town devoid of human life and choked in a perpetual fog, whose roads are blocked off by massive fissures in the ground and patrolled by skinless monsters. On his desperate search for Cheryl, Harry meets several other lone strangers: Cybil Bennett, a policewoman from a neighboring town investigating Silent Hill; Dahlia Gillespie, an elderly antiques dealer who offers to help Harry; Michael Kaufmann, a mysterious doctor who only seems intent on survival; Lisa Garland, a terrified nurse who implores Harry to protect her; and Alessa, a strange teenage girl who always seems to show up wherever Harry goes. And when an air-raid siren goes off in the distance, Silent Hill undergoes a dark and sinister transformation. What awaits Harry within this hellish otherworld? Well...we can't really spoil much of the plot beyond that point, because the game's story rarely explains itself to players. The story revolves around one man's personal struggle to find his daughter, his role as a pawn in a cosmic battle between two powerful entities over the power of a god, arcane occult rituals, reincarnation, possession, drug addiction, and alternative realities. The player receives few explanations for anything that happens, and the story often glosses over (or completely ignores) key events as it offers up intense imagery and deeply psychological horror to the player. Silent Hill offered a unique "psychological" experience during a period when Survival Horror games relied on "sudden fright" scares and Zombie Apocalypse-style action (inspired by the success of Resident Evil). Silent Hill's production team, most prominently the game's writer and director Keiichirō Toyama, later produced Sony's Siren series, which also relied on a more "psychological" storyline. Konami released a remake/reimagining of this game (Silent Hill: Shattered Memories) in 2009. Abandoned Hospital Awakening: According to Kaufmann, he simply dozed off in his office and woke up in this hellhole. Inverted with Harry, who periodically passes out and reawakens back in the Otherworld Hospital. The only other human in there is Lisa, who cannot leave due to some unspoken inclination. Adult Fear: You get to play a parent who is desperately searching a dangerous city for his missing child. Agent Scully: Harry and Cybil seem to think Dahlia's words about the darkness covering the town are nothing but gibberish and a result of drug intake. Nevermind the fact that by the time they say it, they are in a foggy, snowy, desert, monster-infested town with all roads cut off and no means of contact with the outside. Furthermore, by the time they say it, Harry has seen the transition to the Otherworld and Cybil had just seen Cheryl walking in thin air. Of course, Harry the protagonist slowly begins to believe the happenings around them, to which Cybil responds: "You're tired." All Just a Dream: The worst ending. A non-canon Dying Dream. Anachronism Stew: The plot is retroactively stated to have taken place in 1983note This was stated in the "diary" of the protagonist of Silent Hill: Homecoming, posted on Konami's website to promote the game. 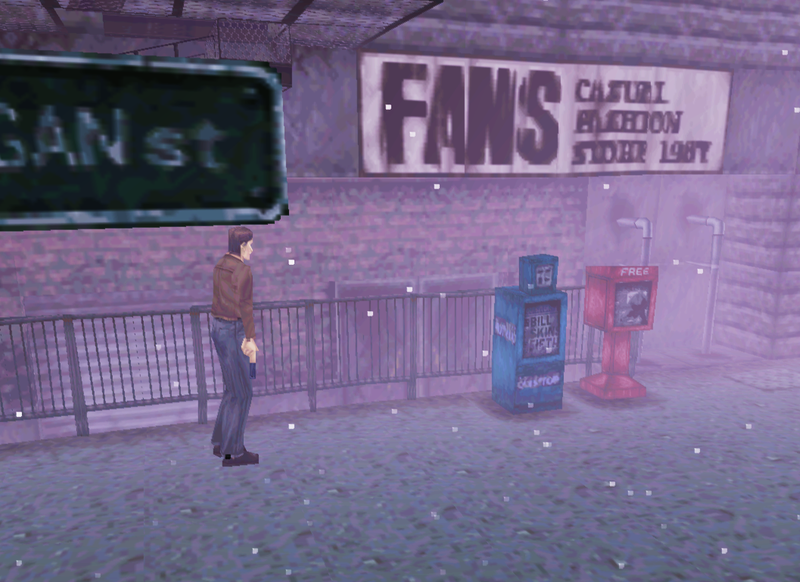 Both the diary and the game it promoted are often considered to be non-canonical, yet the FANS Casual Fashion Store states its year of establishment as "1987" on the sign ◊. Less concrete anachronisms can be drawn from real-life comparisons: The model of Jeep Wrangler that Harry's vehicle takes after wasn't produced until 1985, while the pistol Harry gets from Cybil is a Smith & Wesson Sigma , which wasn't produced until 1994. And Knowing Is Half the Battle: Note the awesome "Study, Dammit!" poster in Store 8. It depicts a hippie pointing a gun at the viewer. Arc Words/Catch-Phrase/Driving Question: The first thing out of Harry's mouth whenever he runs into another NPC is almost always some variation of: "Have you seen a little girl? Short, black hair, just turned seven last month." Armed Altruism: In an act of coolness, Cybil offers Harry her gun. Bad Cop/Incompetent Cop: Cybil. Read above statement, substituting "In an act of stupidity." She also takes little persuasion to let the same civilian explore a mysterious hole before her, a police officer. "Must be on drugs," indeed. Bad Powers, Good People: Alessa has the power to control the Otherworld, which is somewhere worse than "ability to kill puppies by looking at them" on the good/bad power spectrum. Her goal in using this ability, though, is to keep herself from birthing the cult's god through self-destruction. The main character is the unwitting lackey of Alessa's mother, whose actions could easily bring about the end of the world. Baphomet: Incubus, the final boss in the good endings, is patterned after Baphomet. Beware of Vicious Dog: Subverted early on; Harry runs straight into a BEWARE OF DOG sign, but find only intestines on the other side. K. Gordon's doghouse, however, is protected by two of these critters (regardless of what Harry says ◊). Big Creepy-Crawlies: Alessa is a bug enthusiast, and her hobby is reflected in the monsters. Big Red Button: The school's boiler room, and the hospital's power generator. Bittersweet Ending: The canonical ending of the game, Harry escapes Silent Hill with his life and with a baby created from Alessa and Cheryl's re-merged souls, but the Cheryl he knew and raised is gone. Bland-Name Product: The bag of jellybeans containing the Key of Bethor is a knockoff of the Jelly Belly persuasion. There are several throughout Silent Hill, like Queen Burger, Convenience Store 8, and Benny's Diner. Booby Trap: The fridge in Nowhere. It wouldn't be so bad, except that it's the only one in the entire game and happens without any warning. The broken chains and ominous noises coming from inside the fridge should be warning enough. Book-Ends: The GOOD+ ending has Harry and Cybil fawn over infant Cheryl in the cemetery just like in the opening cutscene. After saving, the opening cutscene of a Next Fear game begins with Cybil in the place of Harry's wife. Boss Corridor: Before the fight with Floatstinger. The final room in Nowhere is Alessa's old house. Heather revisits it in a later game. Bowdlerise: The Japanese and PAL versions replace the Grey Children (which had already been toned down from their earlier versions) with the decapitated teddy bear/mole-like Claw Finger, which wouldnt have otherwise appeared until much later in the game. Their attacks are the same, though. The Invisible variant of the Grey Children in Nowhere are also still in the Japanese and PAL versions. Brand X: All over the place, the most famous of which is the Vestal Gigastore (vestal as in vestal virgin; get it?). Theres also Queen Burger, Fedy-X Espresso parcels, Poston Market, the (S)Hell station with the nautilus shell icon, the Circle 8 convenience store with its 7-Eleven motif, and the AEC restaurant that was apparently inspired by A&W. Camera Abuse: Killing the possessed Cybil treats you to a nasty cutscene of her vomiting blood onto the camera "lens" while in her death throes. Cat Scare: Played straight until the cat leaves the scene, and then is devoured by an unseen monster; in the Otherworld, the same locker will still act as if being bumped from the inside by the creature, but opening it reveals a blood-coated, but empty, locker. And then a nearby locker bursts open and a mutilated body falls out. Quite the scare for the uninitiated. Catapult Nightmare: Twice. "Was I dreaming?" Ceiling Cling: Hanged Scratchers are known to camp out on the ceiling. Chekhov's Gun: Two. One is the Flauros, which, like any good Chekhov's Gun, makes its purpose apparent at the right time. The other is the Aglaophotis, which may make its purpose apparent, and only after the knowledge is useful to either Harry or the player. Clock Tower: In Midwich Elementery School's courtyard. Harry uses it to traverse into the Otherworld. 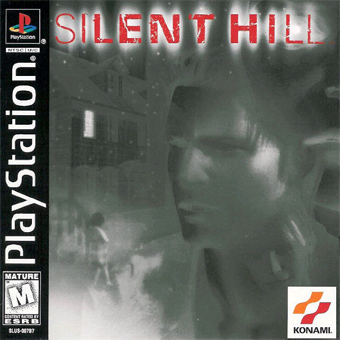 Covers Always Lie: Not the actual box art, but PSM's notorious Silent Hill cover which depicts everyman Harry with a Heroic Build (to say the least...) and strongly implies that the game is a Resident Evil-like, what with Harry and Cybil finding themselves in the middle of a horde, guns drawn. Creepy Cathedral: Harry first runs into Dahlia at the Balkan Church. Creepy Circus Music: The carousel boss. Creepy Doll: Several eerie little dolls are attached to the wall grating in the school Otherworld, and later a few different dolls can be found in Alessa's bedroom. Dead All Along: Lisa, as the only place you ever find her is in the Otherworld; Harry in the (non-canonical) worst (bad) ending. Deadly Doctor: Dr. Kaufmann; also, a number of parasite-possessed mook doctors. Developers' Foresight: For whatever reason, the dev team decided to avoid a particular Unwinnable by Insanity moment. If you somehow make it to the final boss (who flies and is thus immune to melee) without any ammo, it will run a special script, rapidly take damage, and die anyways . Did You Just Punch Out Cthulhu? : Harry fights a manifestation of the cult's god in the final battle. Do Not Run with a Gun: Harry is the worst marksman in the series by far. Justified in that he's a writer; the manual even says he's never fired a gun before. In-game, this translates into his accuracy dropping like a rock beyond mid-range. Drop the Hammer: Emergency Fire Hammer. Less a mallet, more like spike on a pole ◊. Dying Dream: The worst ending reveals the whole game to have been this, but it's not the canon ending. This is the only game where its infamous nurses act the way they do because of a living parasite. There is little emphasis on puzzles; the bulk of the gameplay is on survival and combat. While specific choices during gameplay affect the other games' Multiple Endings, most of them also depend on the behavior of the player. This is the only game where the endings depend on choices alone (In this case, the endings depend on two things: whether Harry saves or kills Cybil Bennett, and whether he finds or doesn't find an important MacGuffin in Michael Kaufmann's apartment). A minor difference is that the monsters don't have as much psychological symbolism as the monsters in later games. Instead, they're simply based off of things that Alessa was either interested in or afraid of (dogs, insects, fairy tale monsters). Harry, unlike other protagonists, isn't a mentally disturbed person who may have repressed memories. He hasn't gone through any trauma (depending on the ending of some other games like Downpour, this does still happen from time to time) unless you count his wife dying prior to the game. He's just a regular man caught up in some insanity he doesn't understand and doesn't really hit a life-changing revelation. He just gets Alessa out of the deal. Worth noting is that in the first four canonical games, only two of the protagonists have repressed memories, and one of them is (Silent Hill 3 spoilers) a reincarnation, which justifies her not remembering her past life or past self. Harry and Henry are both normal men (not so much for the latter) who get caught up in Silent Hill's madness. All other games after Silent Hill 4 have simply tried to copy or borrow from Silent Hill 2, which is why amnesia about some terrible event in the protagonist's life has become a cliché in the series since. Everything Trying to Kill You: Play through the game and note something: only Larval Stalkers and Lisa of everything in the game, never attack, threaten, or antagonize you. And larval stalkers set off the radio, as well as have a mature form as an enemy. Yeah. Even the fridge is trying to kill you. Fantastic Drug: PTV, a hallucinogen derived from a local plant known as White Claudia. In lieu of a proper collection plate, The Order has been trafficking in the drug to fund its activities, recruit cult members by getting them addicted, and keep them involved in their plans by taking advantage of their addiction. Fate Worse than Death: Alessa's fate as an "incubator" for the cult's god. In the scene before the final boss emerges, Dahlia says the trope's name word for word to explain to Harry what has happened to Alessa. Lisa can't even just die. She is apparently just forced to hide in fear of the Otherworld forever, trapped within. When Harry finds her, she's hiding under a desk. She's just a manifestation of the town, but all the same she can't even just die after the horrors she witnessed alive. Final Boss: The Incubator (Alessa, fused with the cult's god) in the bad endings; the Incubus (the god itself, which Harry can expel from Alessa's body with the item from Kaufmann's apartment) in the good endings. Fission Mailed: Beginning a new game involves an introductory scenario in which Harry is ambushed and killed by Grey Children/Claw Fingers, only to have him wake with a start in the diner. Foreshadowing: "Before you pull the trigger, know who you're shooting. And don't go blasting me by mistake, got it?" Four Is Death: The fourth floor of the hospital that appears out of nowhere, leading Harry into the Otherworld. Friendless Background: Alessa Gillespie was branded a witch in elementary school due to the manifestation of her telekinetic abilities. If Harry examines the facsimile of her classroom desk in Nowhere, the surface is scrawled with the words "GO HOME", "DROP DEAD", and "THIEF". Get a Hold of Yourself, Man! : Cybil to Harry in the BAD+ ending. Golden Ending: Unlike Silent Hill 2, Harry's best bet is to try and save everyone. Cybil and Kaufmann can join him for the final boss fight, although Cybil is (as usual) of little use, while Kaufmann only appears if you helped him recover his vial. The Doc proves surprisingly resourceful in the showdown with Dahlia. Having a Gay Old Time: Lisa reminiscing about Silent Hill's past. "Everyone followed some kind of queer religion." HeelFace Door-Slam: In the Good Endings, Kaufmann comes to Harry's rescue and (painfully) exorcises the demon in Alessa's womb, ensuring Alessa herself will survive long enough to help everyone escape. It's not enough to redeem his douchebaggery towards and eventual murder of Lisa, who shows up to drag him off to Hell. Hell Is That Noise: The noises the demon makes after being exorcised out of Alessa's body. Composer Akira Yamaoka has claimed the noise to be a distorted recording of a dentist's drill. Hilarious Outtakes: Only applies to the Bad+ ending and above. Various characters screw up as if they were actors in a film. Holy Hand Grenade: The vial of aglaophotis. I Can't Reach It: The key inside the birdcage. D'oh! The school's rain gutter contains a key lying just out of reach. You'll need to divert the water. "I Know You're in There Somewhere" Fight: Cybil being controlled by the Puppet Nurse parasite. Unless you've collected a key item (and are replaying the game, or have been reading a strategy guide), bullets are the only cure. I'm Cold... So Cold...: Lisa Garland tells Harry Mason that she's "scared and cold" in a futile attempt to convince Harry to stay with her. When he meets up with her again, she reveals her discovery that she's been Dead All Along, and begins bleeding from every pore as Harry watches in horror. Infinity +1 Sword: The emergency hammer in Alchemilla Hospital's power generator room that's obtainable while in the otherworld. It is the best melee weapon you can find and is really good on Puppet Nurses and Puppet Doctors. It's Quiet... Too Quiet: One of Harry's first lines in the game after first deciding to explore the town. Justified Save Point: Fish gotta swim, writers gotta write. Harry takes careful notes on his experiences; these notepads come in handy for Heather in Silent Hill 3. Dahlia putting Alessa through the ritual to give birth to the cult's god resulted in Alessa being horribly burned. At the end of the game, Dahlia gets burned to death by that same god. Kaufmann was abusive towards Lisa and forced her into the psychologically-traumatic job of watching Alessa by using her drug habit as leverage. In the Good and Good+ endings, she hauls him off to his demise. Katanas Are Just Better: One of the unlockable weapons for Next Fear mode. Sends you sliding forward on a cushion of air. Key Under The Doghouse: Harry will need to get past Fido to enter K. Gordon's house. Kids Are Cruel: The Grey Children are the distorted projections of Alessa's abusive classmates. When stabbing Harry, the 'noise' they utter is actually a recording of a child's laughter slowed down. Lighthouse Point: Dahlia sends you here. Macabre Moth Motif: Floatstinger and Twinfeeler, straight out of Alessa's moth display. Meaningful Name: Referencing the Brand X entry above, the Vestal Virgin Wiki entry has an 18th century painting of a vestal, done by one Angelica Kauffmann. Moth Menace: Floatstinger is a giant moth boss with, as its name implies, a big stinger on its abdomen, which it uses to skewer the player. It can also spew poison. It seems to be one of the moths from Alessa's butterfly collection, which somehow came to life. Multiple Endings: They're a staple of the series, and this game features five of them. The ending you get depends on Cybil's fate and whether or not you found an important item in Michael Kaufmann's apartment. The "BAD Ending": The worst ending of the game, it happens if you don't get the item and Cybil dies. Everything turns out to have All Just a Dream, and Harry is dead, still in his broken-down car. "BAD+ Ending": Happens if you don't get the item and Cybil lives. After Alessa disappears, Cybil asks Harry to escape town, but Harry has lost all will to live. "GOOD Ending": Happens if you get the item and Cybil dies. Kaufmann betrays Dahlia and forces the demon out of Alessa; when the deity within Alessa is defeated, Alessa reappears in her final moments to hand an infant to Harry before dying. Harry then sprints out of Silent Hill, making it onto an open road before looking up into the night sky. "GOOD+ Ending": The best ending, happening if you save Cybil and get the item. It's identical to the GOOD ending, but this time, Cybil escapes with Harry and baby Alessa. This is the canonical ending of the game. There is also a joke ending where Harry gets abducted by aliens. Nice Job Breaking It, Harry: Twofold: He is being used as a pawn by Dahlia, with potentially world-ending results, and in a more heartbreaking sense, Harry may be able to acquire the means to save Cybil's life before it becomes necessary to do so. The only problem is, he doesn't know he has the means until after he kills her, which would have to make the final encounter that much more sickening for the man. Nintendo Hard: Compared to later games in the series, most parts of the Otherworld are extremely hazardous, with the volume of enemies pumped up to ridiculous levels. This is particularly true of the city streets, where darting from building to building is your only viable way to stay uneaten. No Name Given: Harry's late wife, who is only seen once, during the opening sequence. Harry doesn't even mention her until his first conversation with Dr. Kaufmann, where he states that she died four years prior to the current events. Supplemental material later identifies her as "Jodie". Offscreen Teleportation: The carousel boss has a nasty habit of doing this. Whenever you run to the opposite side, the enemy reappears from nowhere, casually lounging on a carousel horse. Ominous Multiple Screens: The wall of monitors inside the mall comes to life when Harry comes near. Papa Wolf: Harry is willing to fight his way through hordes of monsters and insane cultists to find his daughter. Portal Picture: In the school's waiting room, Harry comments that the gory painting is in poor taste. He ends up inside of it in the Otherworld. Product Placement/Easter Egg: Amid the numerous knock-off logos scattered around the town, one cargo door has a Jack Daniels Old no. 7 label painted on it. Puppeteer Parasite: The 'worm' controlling Achemilla Hospital's staff. This is the first (and only) instance of Silent Hill's Nurses being linked with an external parasite. Ray Gun: One of the unlockable weapons for Next Fear mode. The aliens gave the Konami light gun to Harry after abducting him in the UFO ending. The color of its laser sight varies to indicate the firepower it packs with each shot, which is determined by the rank attained in the previous playthrough. Red Eyes, Take Warning: Once Cybil wakes after being struck unconscious from behind, her irises shine red, and she treats Harry far less hospitably. Remixed Level: "Nowhere" is a return trip through Midwich, Achemilla, the shopping mall, and Dahlia's store. Rooftop Confrontation: Harry is diverted to the Post Office rooftop for the duel with Floatstinger. Sawed-Off Shotgun: The means of close-quarters crowd control provided to Harry. How he manages to stuff six shells into a double-barreled boxlock has yet to be explained. School Uniforms Are the New Black: Alessa's attire whenever she appears is a blue dress that appears to be some sort of school uniform. She's never shown wearing anything else, other than as Cheryl Mason and in scenes where she's wrapped in bandages. Seeking Sanctuary: After the long, horrific experience of the Otherworld school, Harry is drawn to the Balkan church by the sound of its bells. This is perhaps the only part of the game where there are no monsters present on the streets, not including the very beginning. Snow Means Death: The snow falling from the sky during the middle of summer. Handwaved as ash from an underground coal fire in the movie. Shout-Out: According to Word of God, the plot and nightmare sequences are heavily inspired by Jacob's Ladder. The streets in the first map are named after sci-fi, horror and crime writers - Bloch, Bachman, Ellroy, Bradbury, Finney, Matheson, and Levin. Midwich Elementary School, on the other hand, is named after the John Wyndham novel The Midwich Cuckoos. Midwich Elementary's exterior and textures are modeled from — get this — Kindergarten Cop. Even a few of the school posters are identical to the film. Here are some screenshot comparisons. Alessa's old teacher, "K. Gordon," is a reference to Sonic Youth bass guitarist Kim Gordon. This is confirmed by the reference to three more teachers who bear the names of "T. Moore", "L. Ranaldo" and "S. Shelley" (Kim's fellow bandmates, Thurston Moore, Lee Ranaldo, and Steve Shelley). At the locker room; one of the lockers open up and the locker in front of you suddenly opens, and a dead body wrapped in a bag falls out of it. This could be a Shout-Out to one of the nightmares sequences from A Nightmare on Elm Street (1984), when Tina's corpse (clad in a body bag) slumps out of a locker. The drug the cult is selling, PTV, is named after the band Psychic TV. You can find boxes containing the drug which have the band's full name on them. Michael Kaufman is named after Michael Herz and Lloyd Kaufman, the produces of Troma Studios. Cheryl gets her name from the actress Sheryl Lee; who starred as Laura Palmer on Twin Peaks. Furthermore Lisa Garland's surname comes from the actress Judy Garland. Songs in the Key of Lock: In the school, with the only clue being a poem about birds (and the correct solution produces no music because the keys you have to press are all broken). A Shout-Out puzzle involving a child's toy piano with pictures of birds on it appears in Shattered Memories. The Stinger: Both the good and bad endings have them, though with very different implications. Swallowed Whole: This is a big danger when tangling with Split Head. This battle will test your strafing skill. Teleporting Keycard Squad: The sewer exit key. Immediately after grabbing it, a horde of Hanged Scratchers chase after Harry, forcing him back the way he came. Hope you memorized where the dead ends are. This Is a Drill: One of the unlockable weapons for Next Fear mode. Requires gasoline to power, so drill, baby, drill! Ticking Clock: Dahlia warns that Harry has to stop the Mark of Samael from appearing all over town, or else reality will be irrecoverable. It's a lie; she's really trying to trick him into finding Alessa for her. Token Romance: Averted. Some feel that Cybil's appearance in the opening sequence after finishing with a Good ending suggests this, but there is no other indication whatsoever that this is the case. As Twin Perfect argues in their The REAL Silent Hill Experience videos, it's much more likely that she's simply looking at the baby going "Cute kid." Tomato in the Mirror: Lisa is actually another Puppet Nurse. Once Lisa ventures into the hospital basement, she starts to put two and two together..
Twitchy Eye: Lisa invokes this during her fourth appearance. Undead Child: The Grey Children in the school evoke this, as do their shadowy counterparts in Nowhere. The Larval Stalkers cause radio interference, but prove otherwise harmless. Some players actually like the little critters (since everything else wants to kill the player). Unwitting Pawn: Harry to Dahlia. "Have you seen a little girl? Short, black hair..."